I've bought a lot of models over the years with the intention of building them someday. In fact I've got more than I can remember. Every once and a while I'll stumble across something I forgot I had and then get inspired to build it. Such was the case with this 1971 Ford Torino. I built this fictional late model sportsman car from a basket case old built model that I bought at a swap meet back in the '80's. 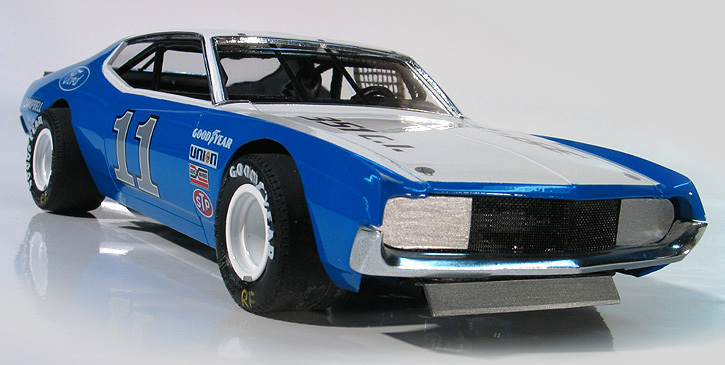 It's an original AMT Ford Torino Stock Car that someone had previously built as a short track racer and the wheel wells had already been hogged out. The front grill had also been cut out and was missing. At that time these AMT Torinos were super hard to find in any condition. I bought it with the intention of trying to replace the wheel wells and returning it back to stock. It was an ambitious project and got back burnered. 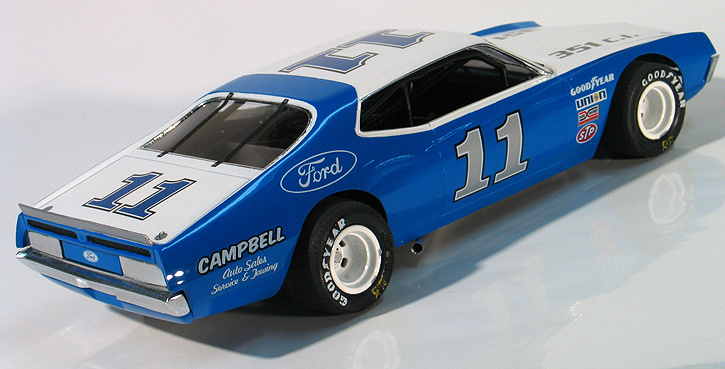 A few years later Revell came out with a really nice all new kit of the 1970 Ford Torino and I kind of forgot about this lost cause. A couple of decades went by and my interested turned to vintage stock cars. I happened to stumble across this model again while I was looking for something else and thought it might be worth rebuilding as a vintage '70's era late model sportsman since it was already half way there. Originally, the model had been brush painted in a thick coat of yellow and dark blue. I soaked the body in a vat of Castrol Super Clean over night and stripped the old paint. The wheel wells had been hacked out sort of amateurishly, so I evened them up with a Dremel tool and then thinned down the back side so the openings would have a more realistic scale thickness. 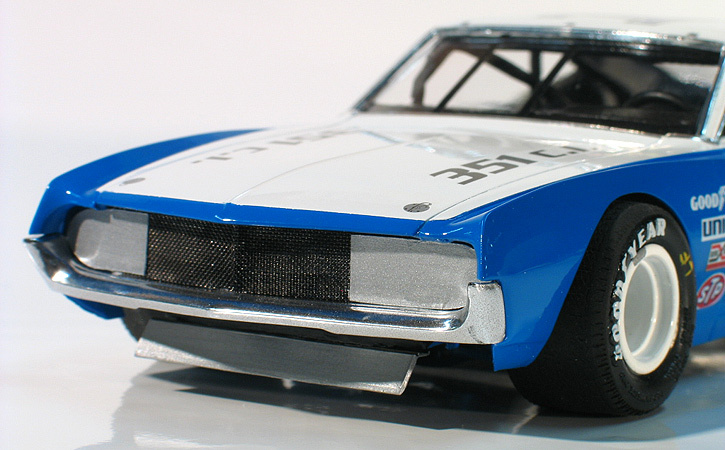 I've reasoned this model was probably the stock car racing version AMT did back in the '70's because the hood on my model was the highly desirable flat version and it had a nice roll rage that fit the interior really well. 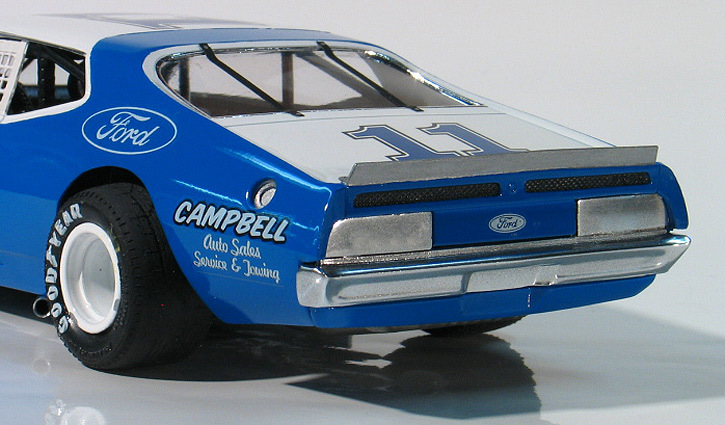 The original AMT Torino Cobra kit has the Cobra Jet style hood. Oddly, when I stripped the paint I found out the hood was molded in clear. 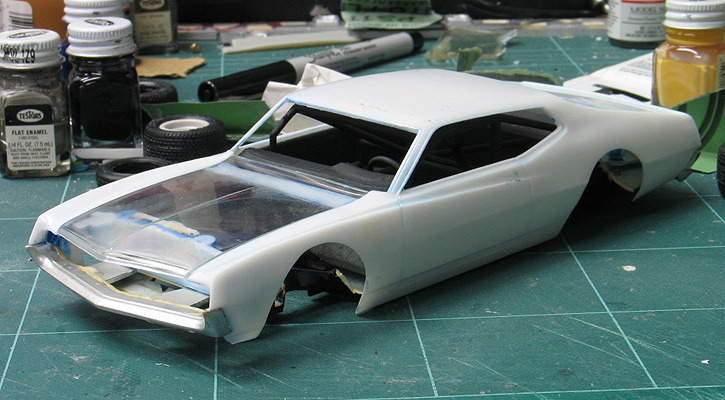 After stripping everything down to bare plastic, I began rebuilding the model. I wanted to make my Torino look like a fictional low budget car that might have ran on a regional late model short track circuit. For paint I choose Tamiya gloss white as a base and over coated it with their TS-15 Blue which is close to the Ford corporate blue color. I didn't use a clear coat and purposely gave it a little scale orange peal because I wanted it to look like the low budget quicky paint jobs most of the real cars got. The decals are all from sheets that I designed for various Model King kits. Many of them were cut apart and repositioned to make something new from what is actually on the sheets. When I designed those sheets I snuck in a lot of friends and family names (like Campbell) so I could use them later for these types of projects. For instance, on the decal sheet I designed for the Model King re-issue of the old MPC '71 Cyclone stock car kit, the driver's name is listed as Chris "Skid" Marx. I actually have a friend named Chris Marks. I use to tease him that if he ever had three sons he should name them Skid, Scuff & Stretch. He thought that was pretty funny, so I added the name to the art work for the production kits. Since the grill was missing when I bought the original model, I decided to replace it with scale real metal mesh and scratch-built headlight covers. This treatment was often done on the real cars of that era. 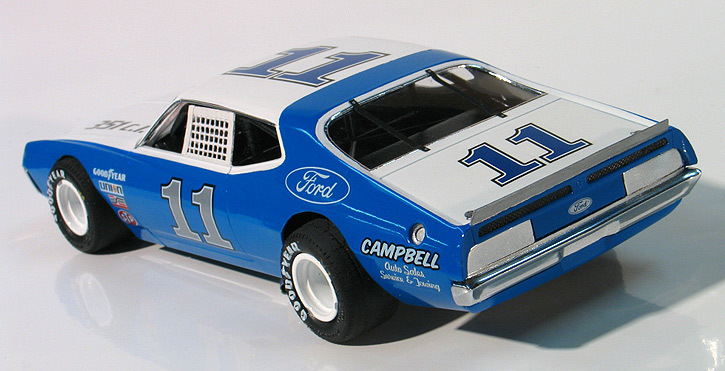 The taillight covers were part of the original kit. The chrome was also very worn and dull so I stripped it and repainted the parts using Alcad. Other mods I added to the body included removing all the trim & emblems, adding front & rear spoilers made from sheet styrene and making the fuel filler in the driver's side quarter panel. The deep dish wheels came from the old AMT '74 Chevelle stock car kit and I matched them to a set of Goodyears found in the re-issued MPC '70 GTO USAC stocker kit. Other details include a window net made from needle point fabric, window straps made from Chart Pak brand thin line tape, and a set of exhausts made from aluminum tube.